What did Alyssa Milano, Bea Arthur and Patrick Stewart have to do with the 1989 hit? The Little Mermaid, the movie that launched Disney’s animated renaissance, premiered 25 years ago this Nov. 15. That might seem hard to believe for those of us who caught it in theaters, but we’ve had a quarter-century of snarfblats and dinglehoppers since then. In honor of the film’s silver anniversary, we’re presenting a list of things that you might not know about The Little Mermaid, even if you were one of those kids who wore out your VHS copy. It’s been alleged that Jeffrey Katzenberg, Disney’s CEO at the time, thought that The Little Mermaid being a “girl’s film” meant it would earn less than the 1988 hit Oliver & Company, which made $53 million during its run. Mermaid eventually made $84 million. Go, Ariel! Disney films and fairy tales seem like inextricable concepts, but before The Little Mermaid, Disney’s previous big-screen adaptation of a classic fairy tale was 1959’s Sleeping Beauty. That’s a 30-year gap. Basically, Frozen fans have Ariel to thank. Multiple real-life people helped inspire Ariel’s look. But according to the DVD commentary, the most famous is Who’s the Boss? star Alyssa Milano, who helped inspire Ariel’s look and personality. However, comedic actress Sherri Stoner served as Ariel’s live action model – and later that of Belle from Beauty and the Beast. Animators incorporated Stoner’s habit of biting her lower lip into Ariel’s mannerisms. Stoner, meanwhile, went on to voice Slappy Squirrel on Animaniacs. Finally, footage of Sally Ride in space helped influence the movement of Ariel’s hair underwater. Speaking of hair, Ariel’s red locks resulted in part from the fact that animators wanted to visually distinguish her from Daryl Hannah’s blond mermaid character in Splash, the sequel to which aired as a Disney Sunday Movie in 1988. Ursula the Sea Witch was written with Beatrice Arthur’s voice in mind, but the role initially went to Elaine Stritch – who, notably, was also considered for the role of Dorothy on The Golden Girls. Eventually, Pat Carroll got the part of Ursula and made it her own. Though octopuses have eight tentacles, animators reduced Ursula’s appendages down to six, to better show off her slinky movements. Carroll claims this makes Ursula half-squid, not half-octopus. Others counter that Ursula’s arms count as her final two octo-appendages. People actually have arguments about this online. Ursula’s large but sensuous physicality was inspired by that of famed drag queen Divine, who originated the role of Edna Turnblad in the original Hairspray. In a deleted scene, it’s hinted that Ursula has a close connection to King Triton. In fact, she was at one point going to be Triton’s black sheep sister and therefore Ariel’s aunt. In the Broadway version of The Little Mermaid this relationship is stated outright. Some concept art of Ursula drew inspiration from the spiny lionfish, and this take on her is every bit as intimidating as the tentacled version we ended up with. Per the DVD commentary, the opening shot takes a few notes from The Wizard of Oz, with the action beginning on an overcast morning above the water, then diving down below the surface to the colorful “Oz” under the sea. “Part of Your World” almost got cut from the final version of the film, after an early test screening had youngsters squirming in their seats during the song. In the end, the cooler (and more mature) heads prevailed. According to the documentary Waking Sleeping Beauty, Jodi Benson performed Ariel’s solo “Part of Your World” with the lights turned down in order to capture a mood befitting a dark grotto scene. “Part of Your World” includes the lyrics “What’s a fire and why does it What’s the word? Burn!” Ariel sings them while looking at a painting of a woman with a lamp, and that’s a real-life painting: the 1640 work Magdalen with the Smoking Flame, by Georges de La Tour. It hangs in the Louvre. 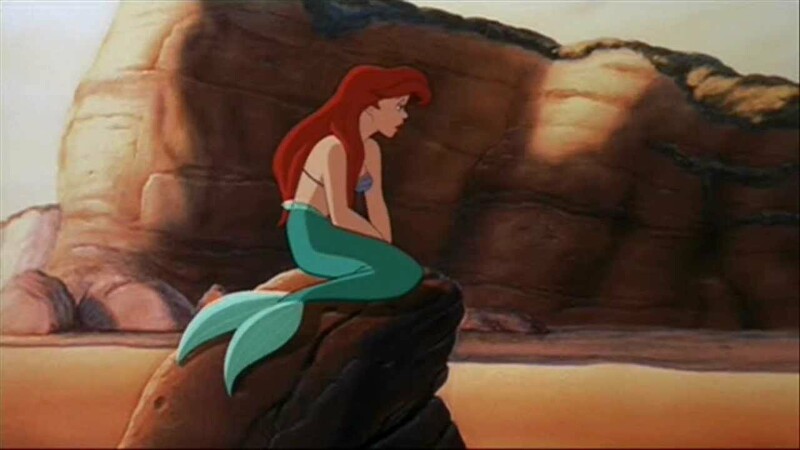 After the fight with Ursula, there’s a scene of Ariel posed on a rock looking at a shipwrecked Eric. Her pose is an homage to the statue of the Little Mermaid that exists in Copenhagen, hometown of Hans Christian Andersen, who wrote the original fairy tale. Sebastian was initially supposed to have a British accent, but eventually evolved into the Jamaican-accented crustacean we all know and love. Samuel E. Wright, who voiced him, later played Mustafa in the original Broadway cast of The Lion King. Patrick Stewart was initially going to voice Ariel’s big bad dad, but he had to give up the role due to scheduling conflicts with Star Trek: The Next Generation. Christopher Daniel Barnes, who voiced Prince Eric and who’s probably most famous for playing Greg in the Brady Bunch movies, was only 17 years old when The Little Mermaid hit theaters. Jodi Benson was 29 in 1989, even though Ariel is 16 at the time the movie takes place. Paddi Edwards, who provided the voices of Ursula’s attendant eels, Flotsam and Jetsam, also voiced Gozer the Gozerian in Ghostbusters. The shark that chases Ariel through the sunken ship is named Glut, though it’s not spoken in the film. Flounder was to have a showdown with Glut later, but that scene was ultimately scratched from the final version of the movie. Of course, there’s the infamous rumor about the movie’s original VHS box art, which featured a tower that people found a little unusual. Disney has long insisted that the structure’s resemblance to anything unusual was purely an accident. The offending structure was removed from later promo art. The Little Mermaid was the first Disney film to receive an Academy Award since 1971’s Bedknobs and Broomsticks, which won for Best Visual Effects. 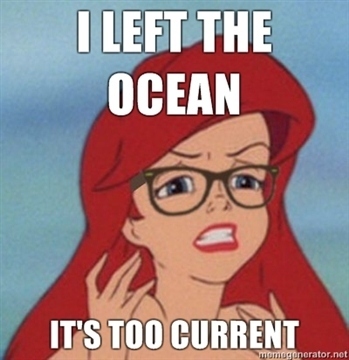 And finally, there’s the gift that The Little World and the Internet combined to give us: the Hipster Ariel meme. And let’s be thankful for that.